Nearing 500 kWp (kiloWatt-peak) cumulative production? Friday, August 8, 2008, Sol3g, S.L. 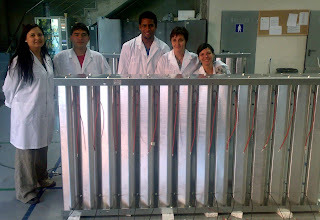 released “Sol3g produces its number 1000 grid” which should be up on the News (Español) section of their website soon. Sol3g states they completed their number 1000 (one-thousand) M40 Module grid from their factory in Terrassa (Barcelona) Spain (please see Sol3g inaugurates High Concentration PhotoVoltaics factory) back on July 15, 2008. Each M40 Module grid consists of fourteen (14) M40 Modules. An efficiency up to 24% and 35 W of power can be achieved under standard conditions: 1000 W/m2 direct normal irradiance and 25ºC cell temperature. versus the 490 kWp cumulative production result with the 35W Power @1000W/m2. It is clear the Flix Solar deal (please see Sol3g lands 800kW High Concentration PhotoVoltaic deal with Flix Solar) used the 30W power specification when ordering their required 26,880 M40 Modules. I expect the Sol3g Terrassa factory will be humming in August 2008 completing the balance of M40 Modules required for the Flix deployment which was slated for completion by the end of that month. Then Sol3g will still need to produce modules for the 400 KW installation awarded to Sol3g by ISFOC in Castilla La Mancha or please see ISFOC Awards 1.3MW of Concentrator PhotoVoltaic power plants. The future plans of the company are to increase the production capacity up to 10 Mw/year for the end of 2008 and to maintain an intense work of investigation and development to continue leading the world-wide market of HCPV systems. The Flix project will be the largest task carried out by Sol3g since its beginnings in 2004. Alter (After) the factory opened, last January, Sol3g has increased its production capacity, and by the end of 2008 the company expects to increase this to 3MWp. back in May 2008 with Sol3g lands 800kW High Concentration PhotoVoltaic deal with Flix Solar. I will seek to clarify this aberrational point with Sol3g. As the U.S. solar energy industry has grown, this conference has become an essential event for global solar energy companies that want to do business in the thriving U.S. market. The strong influx of international attendees is an indication of America’s potential to attract investment, create more green-collar jobs and regain our leadership position. Whatever this rose may be called, this is a regional conference event for national and international companies focused on penetrating and growing solar markets in the United States.